SANTA MONICA, Calif. (AP) Third time was the charm for James Harden. 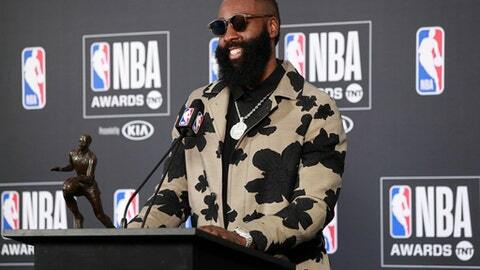 The Houston Rockets star was voted the NBA’s Most Valuable Player after twice being runner-up, beating out four-time winner LeBron James and Anthony Davis of the Pelicans at the NBA Awards on Monday night. Harden received a total of 965 points and 86 first-place votes. James finished second with 738 points and 15 first-place votes, while Davis was third with 445 points and no first-place votes. Harden didn’t prepare a speech. Harden’s teammate, Chris Paul, popped up among reporters backstage and asked Harden how many bottles of liquor Rockets CEO Tad Brown would have to buy at the next location. ”Couple cases,” Harden said, grinning. The Rockets had another winner in Daryl Morey, who was honored as Executive of the Year. In other awards, Ben Simmons of the Philadelphia 76ers won Rookie of the Year. The guard averaged 15 points, eight rebounds and eight assists, joining Hall of Famer Oscar Robertson as the only rookies to post those numbers in a season. Simmons helped Philadelphia to a 52-30 record, including ending the season with a 16-game winning streak. He beat out finalists Donovan Mitchell of Utah and Jayson Tatum of Boston. Guard Victor Oladipo of the Indiana Pacers earned Most Improved Player. He averaged 23.1 points in his first season with the Pacers while nabbing his first All-Star berth. He also led the league in steals for the first time. The Defensive Player of the Year went to center Rudy Gobert of the Utah Jazz. He was the leading vote-getter for the league’s All-Defensive first team while anchoring a Jazz defense that ranked second in the NBA in defensive rating. Lou Williams of the Los Angeles Clippers took Sixth Man honors. The guard became the first player to average at least 20 points for the first time in his 13th season or later. He led the league in fourth-quarter points and scoring average. Williams kissed his two young daughters on his way to the stage after becoming the Clippers’ third winner in the last five years. Dwane Casey was chosen Coach of the Year for his work with the Toronto Raptors, who fired him last month. He has since become coach of the Detroit Pistons. Casey led the Raptors to the No. 1 seed in the East for the first time in franchise history after winning a team-record 59 games. Casey coached the East in the All-Star Game for the first time. Casey won over Quin Snyder of Utah and Brad Stevens of Boston. Robertson received the Lifetime Achievement Award from presenters Charles Barkley and Kareem Abdul-Jabbar. After Barkley mentioned last year’s recipient Bill Russell, Boston’s Hall of Fame center flipped his middle finger in Barkley’s direction. Backstage, Robertson commended the activism of today’s players, although he wondered why more white athletes aren’t speaking out. Robertson went on to say he hopes ”the whites and the blacks get together, even with the football,” a reference to NFL players who have taken a knee or sat in silence during the national anthem to protest police brutality and racial inequality. Former NBA player Dikembe Mutombo received the Sager Strong Award, named for the late Turner Sports broadcaster. He donned a garish sports coat similar to what Craig Sager always wore. The Hustle Award went to Amir Johnson of the 76ers.